South African eco-retailer and online store, Faithful to Nature, has announced the winners of its annual Eco Awards. The awards aim to acknowledge those local brands and businesses that are committed to developing environmentally-friendly products, reducing waste and promoting conscious consumption. South Africans were asked to nominate their favourite local eco-brands that fit into six categories; best eco product innovation, eco-conscious hospitality, active eco-warrior, best plastic-free brand, best grassroots eco initiative and best vegan product. Consumers were then asked to vote for their preferred nominees. Five of the top nominees from each category were then reviewed by a panel of judges and the consumers were asked to vote for their winners. Best eco product innovation – Bamboo Baby (a KwaZulu-Natal-based online store that specialises in eco-conscious cloth nappies and baby accessories). Eco-conscious hospitality – Kindred Kitchen (a plant-based restaurant and smoothie bar situated in Port Elizabeth). Active eco-warrior – Garth Tavares (a Capetonian vegan blogger dedicated to healthy eating). Best plastic-free brand – Back 2 Nature (a Cape Town-based producer of handmade natural skin care products). Best grassroots eco initiative – The Bee Effect (a group dedicated to addressing the decline of honey bees through urban bee farming and bee havens). Best vegan product – Antonia’s (a producer of handcrafted vegan health foods). 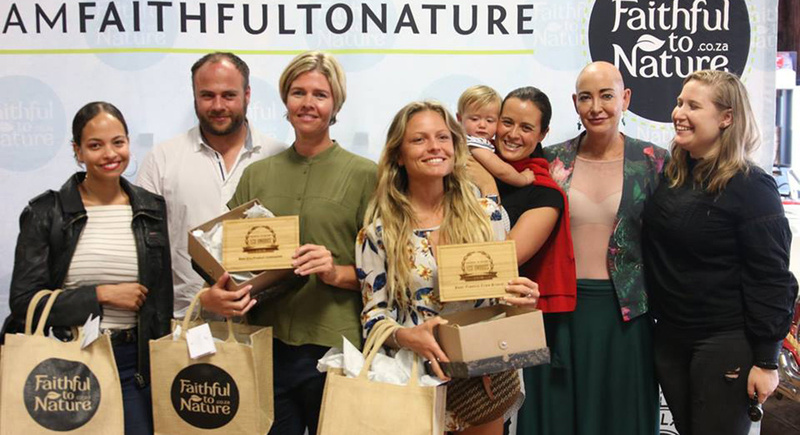 The awards were presented to the brands by Faithful to Nature chief executive officer, Katrien Grobler, at a ceremony in Somerset West. The winning brands received a bamboo plaque to acknowledge their efforts in the eco-conscious field. Guests, representatives and the judges were treated to a vegan harvest table lunch and a wine tasting at Lourensford Wine Estate. “We have a strong group of brands in the country who are working hard to help consumers make more environmentally-conscious decisions about the products they use every day – something heartily deserving of recognition,” says Faithful to Nature founder and director, Robyn Smith. “People are realising the increasing impact of their consumption decisions on the planet – the ‘no straw’ movement is a great example – and we want to support the brands who are helping us be more mindful about protecting the environment,” she explains. Faithful to Nature was started in 2007 with a vision to create an eco-conscious online store for South Africa. The company filters brands according to ingredients and policies used in the production of foods, clothing and other goods. The online store has become a trusted source for ethical shoppers in search of eco-conscious brands.